Intentional Printing walks you through a two-part approach to fabric design. 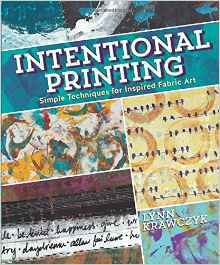 Author Lynn Krawczyk starts by showing you how to develop your own distinct printing style by first identifying the colors, themes, and processes that speak to you and then using those ideas repeatedly to explore your furthest possibilities. At the same time, Lynn urges you to think beyond simply printing fabric and consider how the finished cloth will be used. She demonstrates a variety of printing, stamping, painting, and color techniques, encouraging you to identify what draws you back again and again and to push your personal themes as far as possible. Using examples of her work, Lynn then shows how she adapts her own preferred imagery to projects, explaining what works and what does not. You emerge with a solid knowledge of basic printing techniques, an understanding of how to apply them for maximum impact, and an appreciation of your own personal creative voice.